The first decision we have to make in building a portfolio is what to own. As we are not forecasters, the answer is……………everything(! ), that is priced reasonably and has a good expected return on the investment over the next one to five years. The amounts of what to own are decided based on two factors-first is how attractively priced an investments currently. Buying things when they are on sale seems like commonsense to us. Second, we consider your personal risk tolerance and finances. We need to cobble together a portfolio that is designed to help you achieve your goals in a manner that works for you as an individual. Note that thru this market cycle all three of these areas (the S&P stock index, the Barclay’s Aggregate Bond Index, and the PIMCO All Asset All Authority Fund) end up in pretty much the same place. However, they take 3 very different paths to get there. Most investors could stay invested in the Bond Index during this period or the All Asset All Authority Fund as the bumps in the road are not too severe to endure. The S&P however, was a frightening ride which caused so many to jump ship during 2008 and 2009. Future cycles are not likely to look similar to this current one. The bond index is not likely to have such a smooth ride next cycle nor will it necessarily fare so well over the whole cycle. However, you can imagine that the ideal portfolio would be made up of many pieces that have different paths to all get to the same goal, compounding your money. Obviously, the All Asset All Authority Fund succeeded in this last cycle in reducing your risk and compounding your money. If you look carefully at the chart you can see there are times the fund moves more like the Bond market, times it moves more like the Stock index, and a few times it behaves rather independent of both. 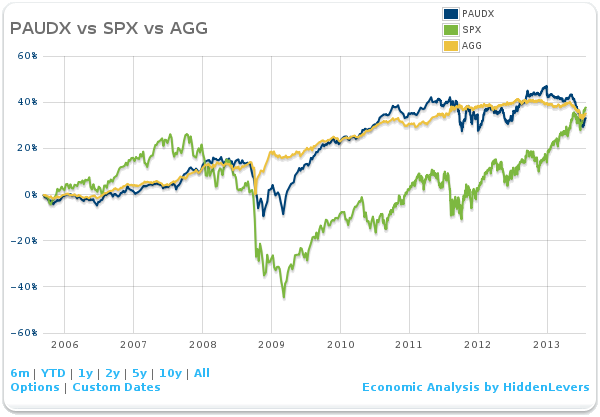 This is a picture of successful diversification by adding a skilled manager who can own whatever assets he chooses. This result cannot be easily replicated by a passive index. Our next blog will drill down a bit more into manager selection.